Recent phylogenetic analyses predict that the vast majority of the major clades of dinos aurs, including the birds, originated in the Jurassic, but little is still known about the Jurassic history of the group. This is partially due to the fact that, although the Jurassic is popularly often regarded as the heyday of the dinosaurs, our knowledge of Jurassic dinosaur evolution is actually based on surprisingly few localities. In the study of the effect of continental break-up on the evolution of terrestrial vertebrates, including dinosaurs, the Middle-Late Jurassic boundary represents a first landmark date, since it was around this time that the continents of the Northern Hemisphere (Laurasia) were finally separated from the continents of the Southern Hemisphere (Gondwana) by oceanic barriers. Thus, it would be suspected that pre-Late Jurassic dinosaur faunas still show a global distribution, which is unaffected by continental boundaries, whereas an increasing differentiation between northern and southern dinosaur faunas is to be expected in the Late Jurassic. In the current project, we will look at especially Late Jurassic dinosaurs to analyse the evolutionary and biogeographic patterns in dinosaurs across the Middle-Late Jurassic boundary, taking into account the dinosaur fossil record, their phylogenetic relationships, and palaeogeographic and palaeoclimatic reconstructions. Foth, C., Tischlinger, H. and Rauhut, O.W.M. 2014. New specimen of Archaeopteryx provides insights into the evolution of pennaceous feathers. Nature 511:79-82. Rauhut, O.W.M. 2014. 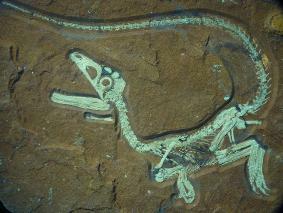 New observations on the skull of Archaeopteryx. Paläontologische Zeitschrift 88: 211-222. Rauhut, O.W.M. 2012. A reappraisal of a putative record of abelisauroid theropod dinosaur from the Middle Jurassic of England. Proceedings of the Geologists' Association 123(5): 779-786. Rauhut, O.W.M., Foth, C., Tischlinger, H., Norell, M.A. 2012. Exceptionally preserved juvenile megalosauroid theropod dinosaur with filamentous integument from the Late Jurassic of Germany. Proceedings of the National Academy of Sciences 109: 11746-11751. Rauhut, O.W.M. 2011. Theropod dinosaurs from the Late Jurassic of Tendaguru (Tanzania). Special Papers in Palaeontology 86: 195-239.